Just over one year ago, I began a campaign on my website, FairUseTube.org calling for much needed reforms to YouTube’s process for disputing copyright claims made by its automated Content ID copyright filtering system. Even though it was possible to dispute copyright claims on your videos, the dispute went right back to the party claiming copyright over your video, who then had the choice to either release their claim or simply reinstate it, in which case the uploader had no further recourse. This of course led to entirely predictable massive abuse by unscrupulous parties falsely claiming copyright (and profiting from the ad revenue) on everything from birdsongs to the NASA Mars rover and President Obama’s attempts at karaoke. Over the past year I have highlighted these kinds of abuses on my website and have been quoted in several media articles on the subject by outlets such as Wired and TorrentFreak. As media awareness of the issue grew, the pressure has steadily increased for YouTube to do something to reform its woefully one-sided copyright dispute process. Today it appears that YouTube has at last bowed to that pressure and enacted at least one major reform that I and other critics have been calling for. In a blog post this afternoon, YouTube announced a new appeals process for Content ID disputes, which should put an end to copyright claimants acting as judges of their own claims and once again giving users whose videos are blocked or monetized by false Content ID matches recourse to the counter-notice process under the DMCA. The new appeals process is described in greater detail here. As I said in a quote on Ars Technica, at this point I am cautiously optimistic about this new appeals process. If implemented correctly, it will be a huge step forward toward protecting the rights of online video creators against overzealous copyright claims. While I do not know exactly when things changed, I first experienced this myself in August of 2011 and received emails from others who experienced it quite a few months before that, possibly as early as mid-2010. So while I am glad YouTube is now admitting the problem and taking steps to correct it, it is still disappointing that it took them possibly several years (depending on exactly how long this has been going on) to realize it might be a problem to let copyright claimants judge disputes against their own claims. Moreover, it remains to be seen exactly how accessible this new appeals process really is to the average YouTube user whose videos are flagged for copyright infringement. While the original dispute process (pre-2010) used to go Content ID claim > dispute > DMCA process, it appears this new system goes more like Content ID claim > dispute > reinstated claim > appeal > DMCA process. While this is an improvement over the current Content ID claim > dispute > reinstated claim > no recourse, it still adds yet another layer of complexity to what is already the most convoluted copyright dispute process of any major user-generated content site on the net. In my own experience, the average user is already bewildered by the current system. Adding an extra layer to the dispute process will only confuse people more. Why not simply have it the way the dispute process originally worked, where any time a user disputed a Content ID claim the claimant had to make the choice right then between dropping the claim entirely or filing a DMCA notice? Since the copyright claimant will ultimately have to make that choice anyway, why wait until after the copyright claimant has reinstated their claim as before, and then the user has been forced to file another dispute in the new appeals process before finally invoking the DMCA process? Uploaders in good copyright standing may be able to appeal up to three disputed Content ID matches that were reviewed and rejected at a time. Additional eligibility restrictions may apply, including the date of dispute and other factors. Uploaders will also be asked to verify their account if they have not already done so. The eligibility for the appeals process may change over time. It will be interesting to see exactly what kind of “eligibility restrictions” YouTube imposes on this. It is quite possible that if you have an old Content ID claim on your video that you disputed and it was reinstated, you still might not be able to take advantage of the new appeals process. The reference to users “in good copyright standing” likely means you will be unable to appeal reinstated copyright claims if you have any outstanding DMCA strikes on your account, just as you are unable to upload videos with creative commons licenses, post unlisted videos, or upload videos longer than 15 minutes. I’m also not sure what this “three at a time” language means. Does this mean you can only appeal three reinstated Content ID claims ever, in a year, in a week, in a day, what? As far as I can tell, the new appeals process hasn’t actually been implemented yet, and it will probably be gradually rolled out over the next few weeks. When it does, I will certainly try it out myself and write a tutorial on it for my existing Guide to YouTube Removals. In the meantime, I’d say online video creators have potentially won an important victory today in the fight to protect our rights against overbearing copyright claims by automated filters, and I look forward to seeing how this plays out in the coming weeks. Throughout the debate over the Stop Online Piracy Act (SOPA) and the Protect IP Act (PIPA), there has been one refrain commonly invoked by the pro-copyright, anti-internet crowd. “There is no first amendment right to infringe someone’s copyright.” Or “copyright and free speech do not conflict.” Leaving aside the obvious fact that the Supreme Court has repeatedly stated that there IS in fact a first amendment right to make unauthorized use of copyrighted material under the fair use doctrine, the idea that copyright and free speech do not conflict is demonstrably false. At its heart, copyright law is a censorship mechanism. It is a way to grant one person or entity a monopoly on certain speech and deny all but those declared to be the “owners” of that speech the right to use it for their own expression. We believe this is justified because it provides financial incentives for speech, and indeed it seems reasonable that people should be entitled to benefit from their creative works. But we must always remember that, at its core, copyright is nothing less than the government dictating who may speak and who may not. Given this, there will ALWAYS be some degree of tension between copyright law and freedom of speech–between the Copyright Clause of the Constitution, and the First Amendment. To say that there is no conflict between copyright and free speech is simply wrong. The conflict between copyright and free speech can be clearly seen when copyright laws are abused and used to censor speech that does not infringe anyone’s copyright. While the pro-copyright lobby may claim otherwise, the truth is such abuses are both common and widespread. In light of bills like SOPA and PIPA which propose dramatically expanding the powers of both the federal government and private copyright owners to enforce copyrights, it is important to keep in mind the ways in which copyright is abused under existing laws, and the potential for even greater abuses should these bills pass. Now that outright DNS blocking and the horrible “private right of action” provisions have been removed from SOPA and PIPA, one of the most dangerous remaining provisions is the section granting “immunity” to search engines, payment processors, and ad-serving networks who “voluntarily” decide to cut-off services to websites which they decide “facilitate” copyright infringement. As many people have pointed out, this will most likely result in a process similar to the existing DMCA takedown process, whereby service providers who are notified by copyright claimants that a particular site “facilitates” copyright law will immediately move to cut-off service to that site for the sake of avoiding liability, regardless of whether that site actually violates copyright law in any way. This is exactly how every content hosting service in existence, from Google to YouTube to Facebook to file hosting sites like Megaupload and Rapidshare (the ostensible targets of SOPA) currently respond to takedown notices under the DMCA. But the “voluntary” blacklists created by private companies under SOPA would have none of the safeguards included in the legally mandated DMCA takedown process, such as the opportunity for accused infringers to file counter-notices and get their content restored. Under SOPA, while companies are encouraged to cut-off service to sites which are accused of piracy, they have no corresponding obligation to restore service if the allegation turns out to be false. The result will be the establishment of private copyright enforcement regimes administered by corporations with no accountability, no safeguards against abuse, and no mechanism for appeal. How do I know this? Because this is exactly what has happened on YouTube, which currently runs the largest private copyright enforcement regime in existence under the guise of its “Content ID” program. As a YouTube video creator who frequently employs fair use in order to make unauthorized use of copyrighted content in YouTube videos, and because of my work advocating for a fairer copyright enforcement system on YouTube through my website, FairUseTube.org, I have been in a position to see just how often such private copyright enforcement systems are abused. Under YouTube’s Content ID system, every video that is uploaded is automatically scanned against a vast database of copyrighted works contributed by YouTube’s Content ID partners. If either the video or audio content matches the digital fingerprint of a sample in YouTube’s database, the system applies the copyright owner’s preselected policy to either block the video outright, allow it to remain up but track its view statistics, or “monetize the video” by taking a cut of the revenue from ads embedded in the video page. While on the surface this seems like a great way for YouTube to allow users to upload videos which use copyrighted content while allowing copyright owners to still make money from their otherwise unauthorized use, the system has two fatal flaws: (1) Content ID matches are notoriously inaccurate and wide-open to abuse, and (2) there is no effective way to appeal mistaken identifications or even blatantly false and fraudulent claims. First, once an entity is accepted as a partner in YouTube’s Content ID program,YouTube apparently does not require copyright claimants to submit any proof that they own the copyright to works which they upload as reference files. There have been numerous reported cases of unscrupulous companies submitting works that are either in the public domain or are simply not owned by them into the Content ID database. This allows them to claim ownership of, block, and/or receive ad revenue from, videos which they do not own any copyright interest in whatsoever. Even when there is a legitimate copyright involved, the Content ID system is often unable to tell a copyrighted work from a non-copyrighted one. This problem is especially severe with regard to recordings of classical music, where the music itself is in the public domain, but specific recordings may be subject to copyright. The Content ID system cannot tell one recording of the same classical song from another, and thus people who have legally used recordings of classical symphonies that were either in the public domain or that they have legally licensed from a third-party music library (and in some cases even performed themselves) have found their videos misidentified as containing a copyrighted recording owned by someone else. Misidentification or even fraudulent copyright claims would not be so bad if there was a means to appeal such false-positives and punish users who abuse the system. But in fact there is not. While YouTube maintains a nominal mechanism for “disputing” false or mistaken Content ID matches, this dispute system is a joke. This is because the person who gets to decide whether to accept the user’s dispute is none other than the copyright claimant himself. When a user files a dispute, the Content ID claimant is given three options: (1) release the claim, (2) have the video taken down via a formal DMCA claim, and (3) reinstate the Content ID claim. While the first option removes the false claim entirely and the second invokes the formal DMCA takedown process under the law (allowing the user to send a DMCA counter-notice and get their video restored that way), the third option reinstates the Content ID match, allowing the claimant to either block or receive all the ad revenue from a video, with no further opportunity for the uploader to appeal. Instead, the user is greeted merely with a message that the copyright owner has “confirmed their claim” to the content. If the user attempts to contact YouTube to further appeal a false claim, they are told that their only option at this point is to convince the claimant to retract their claim. Through this process, YouTube gives copyright claimants the ability to essentially be the judge in their own cases–giving them sole discretion whether or not to accept a dispute against their copyright claim. As experience has shown, Content ID claimants almost universally choose to “reinstate” their claims (likely through an automated process or merely clicking “select all” in the list of disputes). As a result, the Content ID dispute process is next to useless, and those who attempt to dispute a mistaken identification or claim fair use, will most likely find their video re-blocked through Content ID in a matter of days after they file their dispute, with no further recourse or opportunity for appeal. It is important to note at this point, that everything YouTube has done is perfectly legal under current law. Nothing today prevents companies from establishing their own private systems of copyright enforcement which go far beyond the process prescribed in the DMCA, and which contain none of its safeguards against abuse. In YouTube’s case, Content ID exists alongside the DMCA process, as the DMCA provides an alternate means by which videos can be removed for copyright infringement. But while YouTube originally intended Content ID to serve as a kind of front-end buffer to the DMCA process, allowing users to have recourse to the DMCA counter-notice process in the event a Content ID dispute was rejected, that option no longer exists. Instead, Content ID has almost completely supplanted the DMCA process as the primary means of copyright enforcement on YouTube, and users who have videos permanently blocked by Content ID have no recourse to DMCA counter-notices. The reason for that is simple. The current law simply provides no incentive for companies like YouTube to protect their users against false and abusive copyright claims. YouTube would much rather placate major copyright holders like Viacom and Universal Music and avoid expensive lawsuits than stand up for users’ rights by forcing copyright claimants to prove a valid copyright interest in videos alleged to be infringing, or in the very least provide an effective means to appeal false copyright claims. While Google was one of the most vocal parties involved in yesterday’s protest against SOPA, their own system which they have built on YouTube provides a clear example of exactly what we can expect if SOPA passes. When private service providers are deputized to become enforcers of copyright law with no incentive to defend individual users, they will invariably sacrifice the free speech rights of their users for the sake of avoiding expensive lawsuits. YouTube has shown us that nothing good can come of privatizing copyright enforcement, which only serves to harm freedom of speech online. Imagine how much worse it would be, if instead of specific content being subject to such arbitrary blocking as YouTube currently employs, entire websites could be cut-off from all financial services and revenue sources by the mere accusations of big media companies. What would happen if, instead of individual YouTube videos getting blocked, YouTube itself was de-listed from search engines and denied its life’s blood in ad revenue, with no opportunity for appeal? That is what would happen under SOPA. Let us take warning from YouTube’s own practices, before YouTube itself finds itself in the cross-hairs. Over the last few months, I have become increasingly aware of a fatal flaw in YouTube’s copyright enforcement regime, which frequently leaves non-infringing videos blocked for supposed copyright reasons with literally no recourse for the user and no way to dispute the copyright block. YouTube’s copyright policies are confusing enough to begin with, as unlike most other video sharing sites, YouTube has not one but TWO overlapping copyright enforcement systems–it’s automated Content ID system, and the regular DMCA takedown regime that all content hosting sites are required to follow by the Digital Millennium Copyright Act. Videos can be blocked/taken down by either system, and each system has its own process for filing a dispute. If a video is subject to a DMCA takedown notice (which must meet standards established by law), it shows up in your account as “rejected for copyright infringement,” and there will also be a strike placed against your account, which will cause your account to be terminated upon the third strike. If your video makes fair use of the copyrighted content in question or the claim is false, you can file a DMCA counter-notification (also specified by law), and your video will be restored after a waiting period of approximately three weeks. If a video is identified by YouTube’s automated, media fingerprinting “Content ID” system as containing content by a copyright owner enrolled in the Content ID program, several things can happen. The video can remain viewable, but “monetized,” meaning adds will show next to it; it can be blocked entirely (either worldwide or in selected countries), or in the case of audio-only matches, the sound can be muted. These videos show up on your “My Videos” page as having “matched third party content.” Because this is all done by computer and no form of DMCA takedown notice has been sent, videos blocked in this manner do not cause a strike to accrue against your account. If you want to dispute a Content ID block, there is an easy dispute form which you can fill out, which in most cases will cause the video to be automatically and immediately restored, though it does send a notice of your dispute to the copyright owner. If you feel your video has been misidentified by the Content ID system, you can dispute the identification. This involves filling out a short form listing the reason for your dispute. We then notify the content owner whose reference material was matched. The content owner will then review the match. If the content owner disagrees with your dispute for any reason, they will have the option to submit a copyright takedown notice which will result in the disabling of your video and/or penalties against your account. To avoid penalization, only submit legitimate dispute claims. In other words, if the copyright claimant does not accept your dispute, they have the option of escalating to a formal DMCA takedown notice, in which case YouTube’s other copyright enforcement system kicks in, the video would be taken down again, and a strike would be issued against your account. The user would then have the right to dispute a second time using a DMCA counter-notice, and have the video restored once again. According to the DMCA, this is where the process ends, since only if the copyright claimant notifies the service provider that they intent to file a lawsuit seeking an injunction against your video can the service provider leave it offline. Otherwise they are supposed to restore it after the waiting period established by law. This is how the copyright dispute process on YouTube is supposed to work: Content ID match (video blocked) -> Content ID dispute (video restored) -> DMCA notice (video re-blocked) -> DMCA counter-notice ->(video restored unless notice of lawsuit given). This is not how it works practice however. Sometime in the last couple years, YouTube has quietly started acting in a different way, contrary to their stated policy. Instead of requiring copyright owners to file a formal DMCA notice in response to a Content ID dispute, thus allowing users to invoke the DMCA counter-notice process, YouTube allows copyright owners to somehow “confirm” their copyright claim through the Convent ID system and re-impose whatever blocks were originally in place through Content ID. In this case, a message will appear on the user’s “View Copyright Info” page for that video saying, “All content owners have reviewed your video and confirmed their claims to some or all of its content.” After this, as far as I can tell, there is absolutely no way for the user to file a dispute and get their video restored. I had been hearing reports about this happening for months. Because of my website, fairusetube.org and the video tutorials I have posted on YouTube regarding fair use and the Content ID dispute process, people have been posting comments and sending me messages about this for a while. But until last week, it had not actually happened to me (at least where the video was blocked in the U.S. where fair use applies). Then last week, I noticed one of my older anime music videos was blocked pretty much everywhere, including the U.S., by Content ID. I filed a dispute as I have many other times, and the video was unblocked for a few days, and then re-blocked with the message above. No further Content ID dispute was possible, because the record of my original dispute was still there. And when I tried filing a DMCA counter-notice (I tried twice, using both YouTube’s counter-notice webform and a counter-notice emailed to copyright@youtube.com), all I got was an automated response essentially telling me this is a Content ID issue not a DMCA issue. Other emails I have sent about this to YouTube’s copyright support address have gone unanswered. So I’m stuck. My Content ID dispute was rejected, but in a manner other than a DMCA takedown notice, so I am not allowed to take advantage of the DMCA counter-notice process. It appears there truly is no recourse for this situation. My video is blocked, and there is simply no process to file a further dispute and get my video restored again. Contrary to both the takedown process established by law and YouTube’s own stated policy, the condition at the end of the process is that the user’s video remains blocked, rather than remaining up unless notice is given of pending legal action over the video. This situation is frankly outrageous. It was bad enough when YouTube created the Content ID system in the first place, imposing automated blocks on videos with no regard for fair use. It is even worse now that this system apparently has no effective means of dispute, since whenever a copyright owner chooses to “confirm” their claim (as anecdotal evidence suggests they are doing with increasing frequency), there is nothing users can do to fight it. They are literally stuck in a gap between YouTube’s two competing copyright systems–a black hole which YouTube does not acknowledge even exists, and which, to my knowledge, no one else has ever addressed either. Something must be done about this, since until YouTube’s policy in this situation changes, many videos that are perfectly legal and non-infringing will continue to be unjustly blocked by Content ID with no recourse. Earlier this summer, I made the winning video for Public Knowledge’s video contest to create a response to YouTube’s “Copyright School” video, which made only a token mention of the crucial exception in copyright law for “fair use” and portrayed fair use as being too complicated for ordinary YouTube users to understand. Public Knowledge challenged the online video community to create a video presenting a more balanced view of fair use, and my video, “Fair Use School: The Rest of the Copyright Story,” ended up winning that contest and even received a bit of news coverage, such as in this TechDirt article. Soon after my video was announced the winner of Public Knowledge’s contest, I was contacted by Patricia Aufderheide of American University, who is also the director of the Center for Social Media. She graciously offered to send me a copy of the new book she recently coauthored with Peter Jaszi, called Reclaiming Fair Use. I have spent the last few days reading the book while on vacation in Washington state and British Columbia (my family thinks I’m crazy for reading about copyright law on vacation), and enjoyed it immensely. Overall, I found this book to be an excellent resource on the current state of fair use law in the U.S., complete with succinct analysis of changing judicial views becoming friendlier to fair use, and valuable strategic insights for those involved in the copyright reform movement. The basic thesis of Reclaiming Fair Use is that, far from being a dead letter or uselessly vague concept, fair use today is alive and well; and the more people insist on exercising their rights under fair use, the better they can shape the practices which will ultimately come to define fair use for their communities. The book starts out with a brief recapitulation of the many flaws of our current copyright system, which should be familiar to most people concerned with this subject. Copyright today lasts longer than ever, is broader than ever, and actually licensing copyrighted content for new uses is more difficult than ever. This has resulted in a significant chilling effect on the creation of new cultural works, as ignorance about fair use rights and fear of copyright lawsuits have kept many from creating as freely as they might otherwise have done. The authors then give a detailed history of the fair use doctrine, from its origin in the 1800s, through its codification in 1976, up through the present day. Even though fair use went through a brief period of decline in which it was marginalized by a law-and-economics approach to considering whether a new use competed with the market for the original, judges have more recently recognized “transformativeness” as the key element of fair use analysis. If copyrighted content is put to a new use that adds new meaning, message, or purpose rather than merely superseding the original, courts today are much more likely to find fair use, even if the new use could conceivably compete with some market for licensing the original material. While I found the history of the fair use doctrine and current judicial interpretation enlightening (I did not previously know that courts now consider transformativeness to be more important than economic impact), the part of the book I found most fascinating was its insights on the strategy of the broader copyright reform movement. The authors argue that copyright reform advocates were far too quick to concede that fair use is too vague and nebulous a concept to be of any real use to those wishing to put copyrighted content to new and transformative uses. Instead, scholars like Lawrence Lessig and others began advocating either for radical changes to the copyright system that are unlikely to ever happen, or for alternatives to traditional copyright such as Creative Commons. Aufderheide and Jaszi argue that it was a mistake to concede so much ground to content owners, such that many copyright reformers had effectively given up on fair use. As Peter Jenkins once wrote in response to the quick dismissal of fair use by copyright reform advocates, “with friends like these, who needs enemies?” Rather than giving up on fair use and allowing it to atrophy, we should rather be aggressive in asserting our rights to make fair use of copyrighted content. Fair use was deliberately designed to be a flexible concept, very much tied to contemporary practice and community norms. Aufderheide and Jaszi argue that it is up to fair users themselves—not their lawyers or their gatekeepers—to define for themselves what fair use means for their community. One of the best ways to do this is by developing “codes of best practices,” which set forth standards for what is believed and accepted to be fair use by a given community, be they documentary filmmakers or media studies teachers. The authors then go on to cite a number of encouraging examples of how these codes of best practices have helped empower several creative communities to throw off the shackles of unnecessary licensing and fear of copyright lawsuits and begin making fair use of copyrighted content in ways they previously considered impossible. Personally, I found the authors’ insights into the strategy of the copyright reform very enlightening, and was encouraged by the work they have been doing promoting codes of best practices in fair use. I too have previously noted how easily many copyright reformists have given up on fair use as having any practical value. One of the most important things I learned through competing in policy debate in high school and college was the concept of “ground” in a debate, where the side that most aggressively seizes ground in the early stages of a debate and successfully holds onto it usually wins. When viewed in this way, it was indeed a grave tactical error for the copyright reform community to concede fair use early on, as it has only made it much more difficult for us to retake that ground and begin restoring utility to the fair use doctrine. I was glad to read of the many successes the Center for Social Media has had promoting its codes of best practices in several key creative communities. I wholeheartedly agree with the authors that the best way to fight against overly restrictive copyright laws is by boldly asserting our rights under fair use whenever possible. One thing I disagree with the book on, however, is that I don’t think codes of best practices will always necessarily be the best way to do this. While codes of best practices may work great in professional communities such as documentary filmmakers and media teachers, they are much less useful in creative communities that do not have any well-defined structure or representative organizations. This is particularly true in the amateur online video community. While I admire the Center for Social Media’s effort to create a Code of Best Practices for Fair Use in Online Video, I don’t see how it could ever reach enough people to have a meaningful impact. I run a website called fairusetube.org, in which I provide tutorials on fair use and guides for dealing with copyright issues on YouTube. I get messages from YouTube users facing copyright takedowns several times a week, and do my best to help them by giving general pointers about fair use and the YouTube copyright dispute process (without crossing the line into giving legal advice of course). From my experience, most YouTube users know virtually nothing about fair use, and even when informed about their right to dispute copyright claims against their videos, they are too terrified of drawing the ire of copyright owners to risk filing a DMCA counter-notice. Add to this the fact that YouTube’s dual systems of copyright enforcement (both the automated Content ID system and the DMCA takedown process) are hopelessly confusing and leaves gaps in which videos can be blocked with truly no recourse, and copyright continues to be a huge obstacle to online video creators, regardless of the existence of a code of best practices (which most online video creators do not even know exists). Ultimately, as I argued in my forthcoming student note (to be published in the fall 2011 Regent Law Review), I think it will take clear legislative protections for noncommercial, transformative works and real penalties for abuse of the DMCA to solve this problem. And while this criticism goes beyond the book itself, I also don’t think the Center for Social Media’s code goes far enough to cover the majority of what online video creators actually do. It strongly implies that any use of a complete piece of music in a video cannot be transformative, and therefore is unlikely to be fair use. Coming from my perspective as a vidder who has made several highly popular anime music videos, I would disagree with this. Even though my vids use complete copyrighted songs, I (like other AMV creators) deliberately craft my videos so that the music and video are inseparable parts of a new work of art, where both mutually reflect upon the other and add new meaning and message that would not be present with either the music or the video alone. If this isn’t transformative, I don’t know what is. The fact that these songs would be impossible for amateur creators to license any other way should only add to the case for fair use in these situations. Personally, I would love to see a more expansive code of best practices for online video that recognizes things like vidding—even where complete songs are involved—as fair use. These minor criticisms aside, I found this book a highly informative and insightful read on the current state of fair use law, with lots of valuable suggestions on how to reclaim and expand fair use rights in the face of long and strong copyright restrictions. It is a must-read for anyone interested in issues of copyright reform, and I hope it will lead to more and more people standing up and exercising their rights under fair use as one concrete step we can all take to fight against overly burdensome copyright laws. Well this is some of the best news I have heard in a long time! As described in this press release by the Electronic Frontier Foundation, the Librarian of Congress just issued his new list of approved exceptions to the anti-circumvention provision of the Digital Millennium Copyright Act (DMCA), which prohibits circumventing any type of digital copy protection even if the intended use is otherwise authorized by copyright law. The statute directs the office of the Librarian of Congress to conduct a review of this provision every three years and authorizes it to make new exceptions to it as it sees fit. The new exceptions just announced today go much further than previous ones, and include broad exceptions for jailbreaking smart phones (a direct slap in the face to Apple), enabling read-aloud features on e-books, security research on copy protection mechanisms in video games, and the right to circumvent CSS copy protection on DVDs in order to use short clips from motion pictures to create new, transformative works for purposes of commentary or criticism. The educational exception is only slightly expanded beyond what it previously covered, and the Librarian draws at least what in my mind is an utterly arbitrary and baseless distinction between university students and professors and students and teachers at the K-12 level. The Librarian gives absolutely no explanation for why students and teachers in a university setting deserve the ability to use high quality footage ripped from DVD, while elementary and high school students do not. All the ruling says is, “proponents for educators failed to demonstrate that high quality resolution film clips are necessary for K12 teachers and students, or for college and university students other than film and media studies students.” The documentary exception, while important, is also of only limited utility since it applies to a very small class of people–documentary film makers. The most important of these categories is the third, which encompasses most forms of non-commercial “remixing” of movies and TV shows that have become popular on user-generated video sites like YouTube. This exception allows anyone wanting to incorporate brief clips of movies and TV shows in a non-commercial (meaning not for profit) video such as an anime music video or film mashup, is now free to use a program such as DVD Decrypter to rip DVDs to their computer so they can use the footage in their video. Before the passage of this rule, even if the actual use of the footage in a video was fair use, an amateur video creator could still have faced potential liability for breaking the copy protection on the DVD in order to make their video. high quality copies of short portions of the motion pictures. The final video must use only short clips from the original motion picture, for purposes that already qualify as fair use such as commentary or criticism. The clips must be incorporated into a new work. In other words, the use must qualify as transformative under the existing fair use criteria. pictures in order to adequately present the speechrelated purpose of the use. purpose, such noncircumventing alternatives should be used. Thus the idea seems to be that if another means of obtaining the desired footage (albeit in a lower quality) would suffice, you should do that, and breaking copy protection is only allowed when the use requires a higher quality than could be obtained through those other means. How exactly a court would decide when exactly that is, I have no idea. At least in my opinion as someone who makes these kinds of remix videos, I can’t imagine a situation where I would be satisfied with methods like screen capturing (which the Librarian cites as an example) or cam-cording a TV screen (the MPAA’s suggestion). Both of those methods produce horrible quality video far inferior to that which can be obtained by simply ripping the DVD to your hard drive and transcoding it to an easily edited AVI file. To require video creators on YouTube to use those kinds of methods instead of ripping would forever relegate them vastly inferior quality. Hopefully if the issue ever came up the courts would be satisfied by the video creator’s subjective judgment that the quality obtained by ripping the DVD was preferable to the alternatives. Another thing I have questions about is the scope of the rule. While the rule specifically mentions CSS protection on DVDs and appears on its face to be restricted to that, I wonder if courts might construe it to apply to other similar types of copy protection, such as the AACS copy protection used on Blu Ray discs or the copy protection used on digital movie downloads from iTunes or Amazon. Since HD video is rapidly increasing in popularity both in general and in user-generated content on sites like YouTube, it makes little sense to restrict this exception to one particular type of copy protection used only on lower quality standard definition recordings, when the principle behind the rule clearly applies to all types of video copy protection. It is also disappointing that the Librarian restricts the ruling to only apply to motion pictures, and specifically excludes other audio-visual works such as video games, even though in reality footage from video games is used in remix videos almost as often as films (my own Final Fantasy music videos, for example). Despite these limitations which make the new rule not as good as it could have been, it’s an important first step in recognizing the fair use rights of internet users to make non-commercial remixes of popular video content. Remixing is a growing art form that is an important part of the new participatory media culture that is thriving online, and it’s nice to see the government finally starting to recognize the legitimacy of that culture by protecting the right to rip DVD footage to produce these types of transformative works. Now in honor of the new rules, I think I will add a tutorial on how to rip DVD footage and import it into video editing programs to my website, FairUseTube.org! I’ve been meaning to write on this subject ever since I began playing Second Life a few months ago and started exploring the many unique environments it has to offer. For those not familiar with it, Second Life allows users to create vast virtual environments and to buy and sell virtual goods with an in-game currency that is exchangeable with real currency. Second Life itself is extremely interesting from a copyright perspective, since its entire virtual economy is based on copyright. Since the in-game economy is based on buying and selling virtual goods, the value of these goods relies on artificial scarcity produced by copy protections ultimately backed by copyright. It is another aspect of copyright in Second Life that I am interested in right now, however–namely the copyright implications raised by the nature of many of the virtual environments themselves. I have previously written on one important type of fan-made “remixing” of popular intellectual properties in the form of anime music videos and similar fanvids. I argue that these types of fan-made media provide far more benefit to the original copyright holders than harm, and that these types of uses should be considered “fair use” under U.S. copyright law. In virtual worlds like Second Life however, there is an even more elaborate and sophisticated type of fan-made media that is even more threatened by excessive copyright enforcement–virtual environments based on copyrighted books, TV shows, and films. 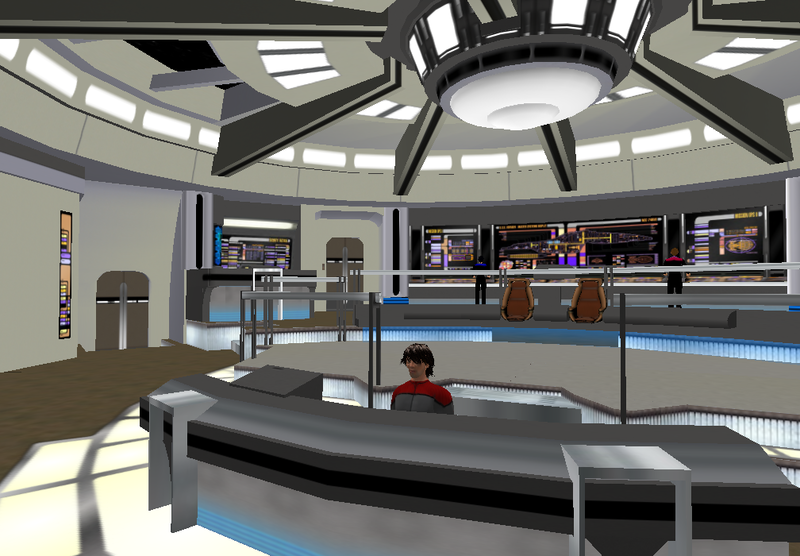 On the bridge of the USS Voyager in a Star Trek themed sim. 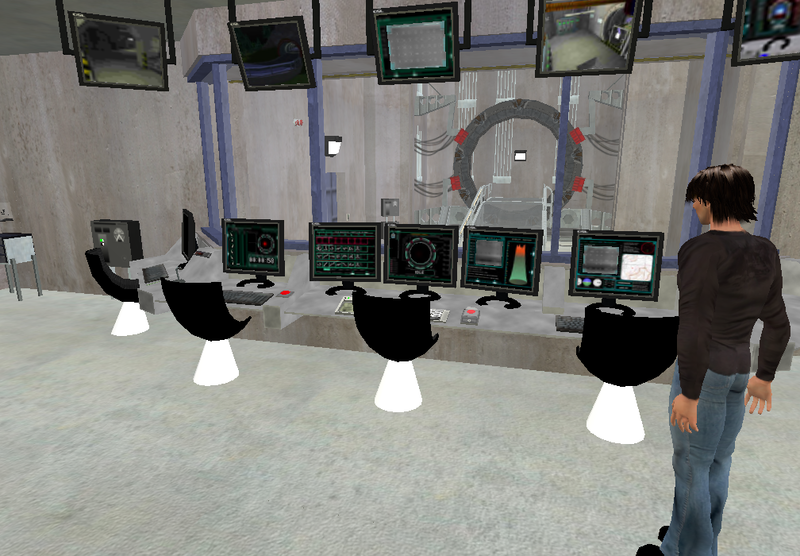 Stargate Command, from Stargate SG-1. 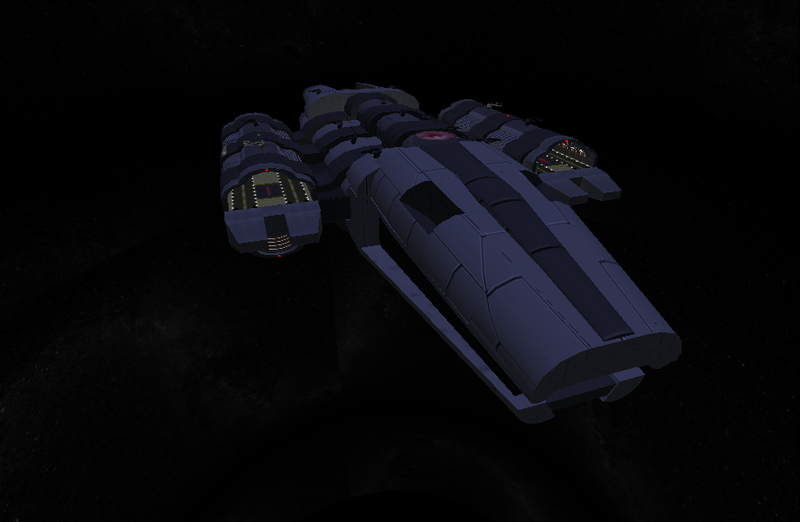 The Battlestar Phoenix - an imitation of a battlestar warship from Battlestar Galactica. 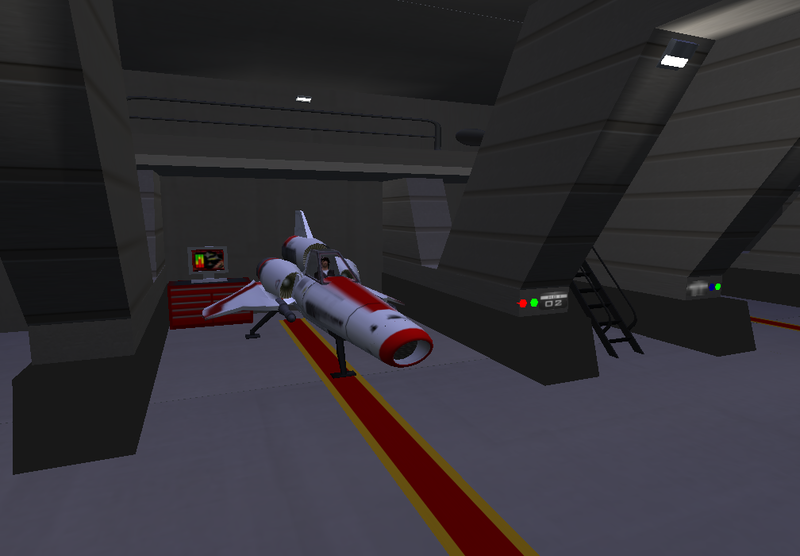 Boarding a "Viper" starfighter in another Galactica themed sim. The city of D'ni from the Myst Uru videogame. As you can see, all of these sims are highly detailed, realistic recreations of environments from several highly popular intellectual properties–meticulously modeled down to the tiniest detail by fans who will often spend months creating these sims. And I am willing to bet most sim owners do not go through the trouble of attempting to license their sims, if that would even be possible considering how inaccessible the licensing departments at most major media companies are to ordinary individuals. This makes all of these sims potentially copyright infringing, and leaves them all merely one DMCA notice away from being taken down. This is indeed a serious risk, as those who create these seems must invest a considerable amount of time and money into creating and maintaining them. Running a full-size sim in Second Life can cost around $400 a month, which is paid either out-of-pocket by the sim owner or through donations and virtual sales paid for by members of various role-playing groups. The creators of sims like those above based on popular IPs thus run the risk not only of a lawsuit for copyright infringement, but significant financial loss as well if the sim is taken down–a risk that is not present for fanvids uploaded to YouTube. And it is a significant risk, since I found at least one instance where a Dune themed role-play sim was forced to sanitize their sim of all Dune related material after a copyright claim by the movie studio which owned the rights to the Dune series. Fortunately for them they were able to remove the aspects of the sim explicitly related to the Dune series and turn it into just a generic sci-fi desert planet sim, but for some of the sims shown above that would not be an option, since the entire sim is related to their parent sci-fi series. Under current copyright law, it is highly questionable whether these sims would be considered fair use by a court if an infringement suit based on them ever came to trial. For a use of copyrighted material to constitute fair use, it must satisfy the four-part test of (1) the purpose and character of the work, (2) the nature of the copied work, (3) amount and substantiality, and (4) effect on the original work’s value. The first and fourth are the most important, which is why I will concentrate on them. Under the first prong, since these sims do not directly copy anything from their source, they would fall under the derivative works right, and much of the fair use analysis would depend on whether they are “transformative” or merely “derivative.” In most cases sci-fi themed sims try to duplicate original environments from movies or TV shows as faithfully as possible, though they may change minor details or fill in parts that were not shown in the original show. It seems to me that these sims would thus be more of a simple adaptation of the original than a true transformation, since they are merely taking copyrighted scenes and adapting them to 3D virtual environments. It is a process quite similar to when movie studios license movies to videogame companies to adapt into video games. Another important part of the first prong is whether the use is commercial or noncommercial, with noncommercial use more likely to be fair use. Most sims barely bring in enough income from donations to pay for the sim, and many sims help offset the cost by selling virtual goods which are themselves modeled after things in the series. It is possible to buy a wide variety of outfits (i.e. a Starfleet uniform), spaceships (i.e. a Puddle Jumper from Stargate, a Viper starfighter from Galactica, or the Millennium Falcon from Star Wars), and weapons (i.e. lightsabers from Star Wars), which are either fully operational in the game environment or serve as decoration. While sci-fi themed sims are probably still not making a profit (or at least not a large one), this does add a commercial aspect to them that makes it difficult to characterize them as strictly non-commercial. On the whole then, these sims probably do not satisfy the first prong of the test. The second and third prongs are likewise questionable. The nature of the copied work is literary/artistic, which generally weighs against fair use. Under amount and substantiality, while these sims don’t by any means incorporate all or even most of the original work, they do often simulate the most important locations in their parent series, and could thus be said to take the “heart” of the copyrighted work. Finally the fourth prong is also fairly weak, as adapting movies and TV shows to video games is an established market which a well-made Second Life sim could be said to compete with, though it is doubtful this could be empirically proven. This would however make these sims likely to fail the fourth prong as well, disqualifying them from claiming a fair use defense. 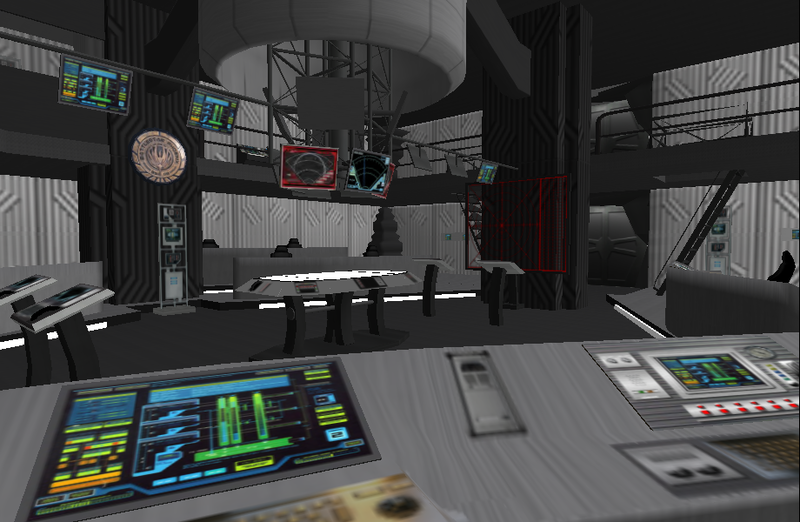 Under current copyright law, therefore, it appears that these types of Second Life sims based on recreating environments from copyrighted films and TV shows are likely infringing. The question is, should they be? I believe the answer to that is no. While these types of sims may be derivative and even have limited commercial aspects, and may at least in theory compete with other video games based on these franchises, in reality any negative effect they could have on other markets would likely be negligible at best. Even the best made Second Life sims are still amateur and rather clunky in comparison to professionally made video games. 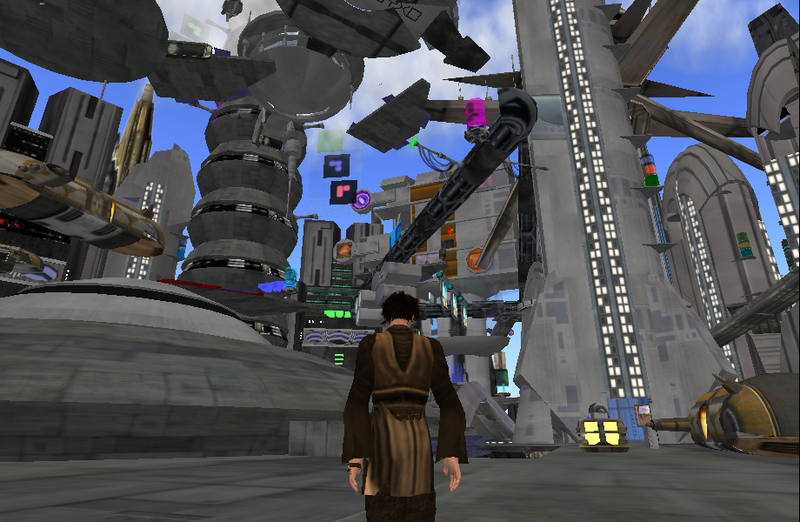 Even if made by an experienced sim developer, the Second Life platform simply doesn’t allow for the same degree of functionality and realism that a professionally produced video game has, and consumers would be highly unlikely to forgo buying an officially sanctioned video game in favor of Second Life role-play environments. 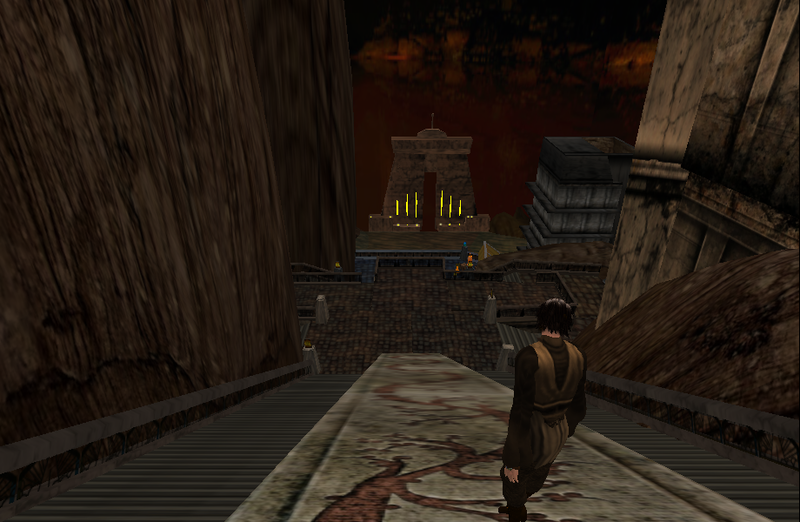 For example, would a Star Wars fan prefer the Star Wars themed environments in Second Life over the latest Knights of the Old Republic game? Not likely. The two are entirely different and the Second Life environments would be highly unlikely to decrease the market for the other. And even though there is an established market for licensing IPs for adaptation into video games, it’s not like the people who make Second Life sims could afford to pay the studios’ exorbitant licensing fees anyway, eliminating any possibility that they could be a revenue source for the studios. More importantly, fans creating their own virtual worlds based on their favorite films and TV shows represents a type of cultural innovation that should be promoted rather suppressed by overly restrictive copyright laws. Lawrence Lessig loves to talk about a quote from John Phillip Suzza, who feared that the invention of the phonograph would stop young people from joining together to sing the songs of the day and would turn them into merely passive consumers of media. And that is precisely what happened with 20th century media technologies, which created separate and distinct classes of cultural creators and cultural consumers. Modern computer technologies have reversed this trend and allow “consumers” to now directly interact with the stories and songs that form our culture–in this case by actually “creating” the very worlds in which those stories take place–albeit virtually. Ever since books and movies have existed, they have formed the backbone of our culture as common cultural reference points which we can all share and relate to. Moreover, they have always been a starting point for our imaginations, which allow us in a sense to participate in these stories ourselves. How many Star Wars fans have not indulged in daydreaming about what it would be like to live in the Star Wars galaxy, or perhaps imagined themselves as part of that great saga? 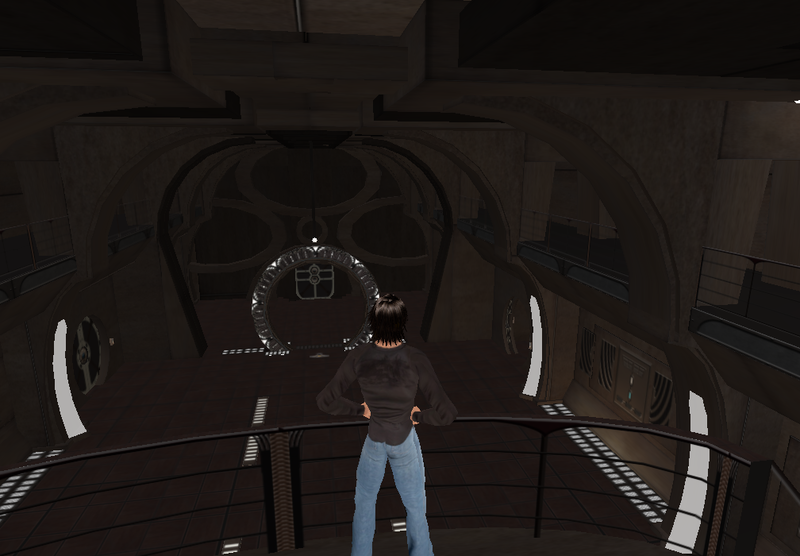 Now with virtual world technologies like Second Life, individuals have the ability to play out such fantasies in a far more concrete manner, actually walking the streets of Courscant or flying on the Millennium Falcon in the guise of their Second Life avatar. It is a natural evolution of the universal desire to interact with and build upon our culture. It was precisely this type of cultural enrichment that copyright law was designed to promote rather than hinder. It does so primarily by providing financial incentive for authors and artists to create, but we must not lose track of the fact that its ultimate goal is cultural enrichment. Copyright was never meant to give certain big companies a monopoly over culture, and in cases where fans’ follow on creativity builds on major cultural icons like Star Wars and Star Trek without substantially harming the ability of the original creators to profit from their work, it should be encouraged rather than suppressed. Not every use of copyrighted material that can be licensed should be subject to license, as in some cases it may end up decreasing cultural enrichment rather than increasing it. Such is the case here, for if copyright laws were to be rigidly applied to prevent Second Life users from building environments based on these cultural icons, a great deal of incredible creativity would be lost. This matter will only grow more important as virtual worlds continue to mature (perhaps someday even to the level of the fully immersive virtual reality portrayed in the TV show Caprica), and I can only hope that courts and legislatures begin to see the importance of protecting such follow-on creativity before copyright law is allowed to stifle this world of possibilities they represent. It is high time we expanded our concept of “fair use” to include these types of fan-made creations, for until we do, the law will continue to cast a pall of uncertainty on all such endeavors, producing a chilling effect that can only discourage a great deal of otherwise culturally beneficial creativity. The latest casualty of unjustified DMCA takedowns on YouTube appears to be the recent viral video hit “The Day ObamaCare Died,” which hit the web in October 2009 and was especially popular soon after Scott Brown’s stunning victory in Massachusetts last month. The video was originally created by YouTube user HerBunk, and featured a parody of the song “American Pie” (originally by Don McLean) sung by Obama sound-alike Paul Shanklin. The animated video was an instant online sensation, especially among conservative and Republican bloggers, for its humorous portrayal of President Obama lamenting the defeat of his monstrous health-care bill. Now that video is no more. I made “The Day ObamaCare Died” and I uploaded it in October 2009. I put in about 30 hours of work in making the video. My copyright for the use of the song was challenged almost immediately by Universal Music Group (WMG). I beat that challenge because I had received Paul Shanklin’s permission for the use of his song. UMG owns the rights to the Don Mclean song “American Pie” also known as “The Day the Music Died” and persisted in their objections to my video on YouTube. In Dec 2009, when it had almost 700,000 hits, YouTube folded and told me that despite the fact that I wasn’t infringing on UMG’s copyright they had a contractual agreement with UMG and told me to remove the video or they would close my account permanently for failing to comply with YouTube’s “terms of service.” I removed the video. Even though ObamaCare may really be dead, I apologize for not being able to sustain the protest against it. If this is the case, this is a sad state of affairs indeed. If his statement is accurate, it seems both YouTube and Universal acknowledge that Universal has no copyright claim against the video. This is certainly true as this video is a prime example of precisely the type of speech the Fair Use Doctrine of U.S. copyright law was designed to protect–a politically motivated parody that is transformative and non-commercial in nature and in no way competes with the market for the original song, yet because of its controversial subject matter it would be highly unlikely to ever secure the copyright holder’s authorization. What’s troubling here is that Universal and YouTube appear to know that, yet Universal insisted on censoring the video anyway, and YouTube was forced to play along because it doesn’t want to alienate Universal. While YouTube does have a contract with Universal allowing UMG’s songs to be used in YouTube videos, I highly doubt that contract requires them to censor any video Universal doesn’t like even where Universal has no legitimate copyright claim against it. This is a simple case of two large companies teaming up to abuse copyright law in censoring legitimate political speech. Anyone who values the right to free speech that we enjoy in this country should be outraged by this move, and personally I hope that the Electronic Frontier Foundation may take notice of this incident and file a lawsuit to stop this outrageous behavior. In the meantime, I found a copy of the video on another video site and have re-uploaded it to YouTube under my own account. Maybe I will have better luck keeping it online than the original creator. You can view the video below. Please pass the word about this video and let Universal and YouTube know that they cannot get away with abusing copyright law to censor non-infringing political speech. Contrary to the claims of many copyright holders, copyright is not based on the recognition of a fundamental right to control and benefit from intellectual property, but is rather an economic bargain to encourage socially beneficial creativity. Indeed, Congress has explicitly rejected the idea that copyright is based on natural rights, but has instead stated that its purpose is for the benefit of the public. Economically, creative works (also called “information goods”) such as music are considered “public goods,” which are characterized by non-rivalry (one use does not compete with another) and non-excludability (difficult or impossible to limit access to). These goods are typically difficult to profit from, and because they generally have fairly high production costs, there would be little incentive for people to produce them unless there is some guarantee that they can profit from their efforts. Copyright laws protect producers’ ability to price information goods above their cost of production by artificially limiting the supply of those goods and restricting access to them, reintroducing rivalry and excludability to what would otherwise be public goods. These restrictions allow creators to profit from creative works, motivating the production of works that would not otherwise be created. While this involves some loss to society through decreased access to copyrighted works, the monopoly created by copyright is considered justified as long as it results in a net gain to society in the form of more information goods being produced. Conversely, when the exclusive rights granted by copyright do not result in a net benefit to society, they are not justified. Therefore, if a particular right granted by copyright law does not produce a net benefit to society, it should be removed. Mark S. Nadel, How Current Copyright Law Discourages Creative Output: The Overlooked Impact of Marketing, 19 Berkeley Tech. L.J. 785, 787 (2004). See H.R. Rep. No. 60-2222, at 7 (1909) (“The enactment of copyright legislation by Congress under the terms of the Constitution is not based upon any natural right that the author has in his writings . . . but upon the ground that the welfare of the public will be served. . . . Not primarily for the benefit of the author, but primarily for the benefit of the public, such rights are given. . . .”). David Lindsay, Centre for Copyright Studies, The Law and Economics of Copyright, Contract and Mass Market Licenses 23 (2002), http://www.copyright.com.au/reports%20&%20papers/IssuesPaper_Lindsay.pdf. Id. at 24 (“To the extent that an information producer is unable to recover the costs of production, incentives for the production of information goods, such as copyright material, are undermined.”). Nadel, supra note 4, at 787. See Bonito Boats, Inc. v. Thunder Craft Boats, Inc., 489 U.S. 141, 146 (1989) (“The Patent Clause itself reflects a balance between the need to encourage innovation and the avoidance of monopolies which stifle competition without any concomitant advance in the ‘Progress of Science and useful Arts.’ ”).